Best known for its stunning scenery and friendly locals, Iceland is home to lava fields, geysers, and more volcanoes than you can count. 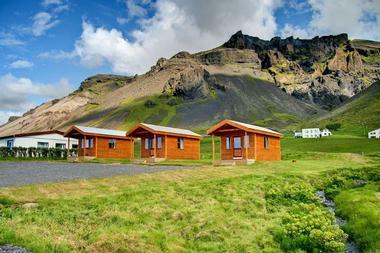 You'll need somewhere to base yourself while you explore the country, so whether you're looking for a cozy family-run retreat tucked away in the wilderness or a luxurious five-star resort with all the amenities, here are the best accommodation options for your trip to Iceland. 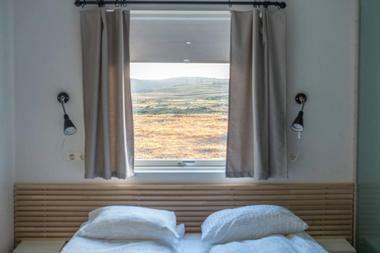 Deplar Farm is a unique luxury hotel in Ólafsfjörður on northern Iceland's Troll Peninsula, housed within a converted sheep farm facility. The modern hotel is an outdoor adventurer's paradise, offering a fully-stocked gear room with equipment for skiing, surfing, hiking, and horseback riding excursions and a plethora of other outdoor sporting opportunities. Guest rooms and suites offer fine Kiehl's brand bath products and a minibar restocked daily with delicacies such as dried fruit, hummus, and housemade alcohol. Luxurious onsite amenities include a spa and steam room, an outdoor sauna, and a fitness center with a yoga studio and flotation tanks. Floor-to-ceiling windows line the hotel's farm-to-table restaurant, which serves up splendid daily meals at breakfast and dinner prepared with locally-sourced meats, produce, and craft brews. Set on a property with a working dairy farm, Efstidalur II is a laidback farm stay with ten rooms and complimentary Wi-Fi. There is an on-site restaurant that specializes in dishes prepared with locally sourced ingredients; the restaurant is open for lunch and dinner every day, and guests can enjoy a delicious breakfast buffet for an additional fee. There is also an ice cream bar that serves ice cream made from dairy produced right on the farm. Horseback rides can be arranged upon request, and there is an outdoor hot tub that visitors are welcome to use year round. Conveniently located between Skaftafell and the Jökulsárlón Glacier Lagoon, Fosshotel Glacier Lagoon is a modern four-star hotel with more than 100 well-equipped rooms and suites for guests to choose from. Many of the rooms boast breathtaking views of the surrounding mountains, and some have comfortable sitting areas with bay windows. Breakfast is included in the room rate, and the stylish hotel restaurant is open every day for lunch and dinner. If you'd like help planning your trip, the hotel staff are always happy to provide guests with information about the surrounding area and can provide assistance with booking tickets and tours. 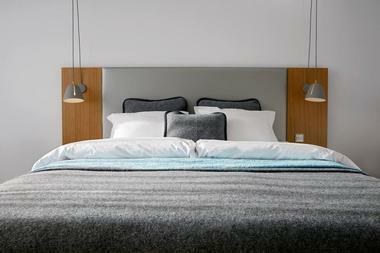 Opened in 2015, Geo Hotel Grindavik is set in the quaint fishing village of Grindavík. Both double rooms and family rooms are available, and guests are also encouraged to make themselves comfortable in the cozy lobby sitting room. The famed Blue Lagoon is only 4 miles away, and the hotel is within easy walking distance of plenty of restaurants and cafes as well as amenities like a grocery store, a thermal swimming pool, and a church. Breakfast is included in the room rate, and the hotel is proud to offer complimentary transportation to and from the Blue Lagoon. Tucked away in the countryside only 10 minutes away from the village of Vik, the Grand Guesthouse Gardakot is a luxurious family-run guesthouse with four rooms. The house sits on a beautiful hobby farm that is home to chickens, a dog, and more than 30 sheep, and a communal kitchen and dining area are available for guests who want to prepare their own meals. Two of the rooms have private bathrooms, and all come with free Wi-Fi and satellite television. Each room can accommodate two people; groups of eight guests or fewer can rent out the entire house if desired. 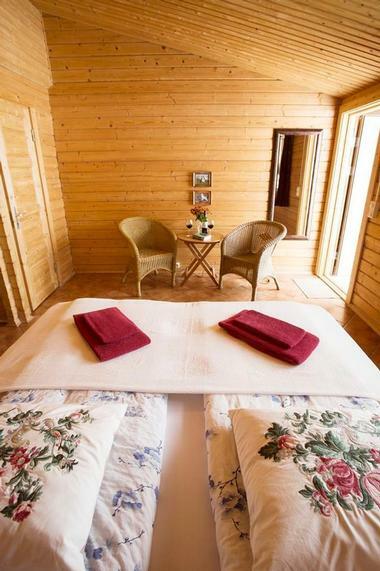 Guesthouse Steig is located on a gorgeous farm only 3 miles away from the Dyrhólaey Cliffs, and it offers 12 comfortable rooms as well as a shared living room for guests to relax in. Breakfast and dinner are provided upon request, but guests are also free to use the communal kitchen. Rooms have either shared or private bathrooms, and some rooms offer fantastic views of the ocean or the nearby Eyjafjalla Glacier. Sheep, chickens, and dogs can be seen outside on the farm, and the staff are able to communicate with guests in both English and Dutch. 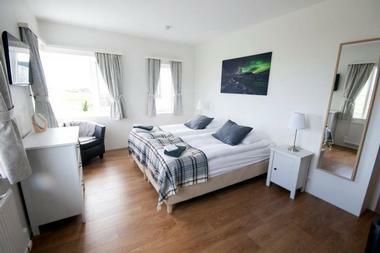 Offering comfortable rooms and two-bedroom apartments, Hali Country Hotel is the closest guesthouse to the beautiful Jökulsárlón lagoon. All rooms are equipped with flat-screen TVs, private bathrooms, and in-floor heating, and they offer views of either the surrounding mountains or of the ocean. A complimentary breakfast buffet is provided every morning, and free coffee and tea are offered in the lobby all day long. Kitchen facilities are only available to guests staying in the apartments, but the hotel restaurant offers an excellent selection of traditional Icelandic dishes and is open from 7:30 a.m. until 9 p.m. every day. 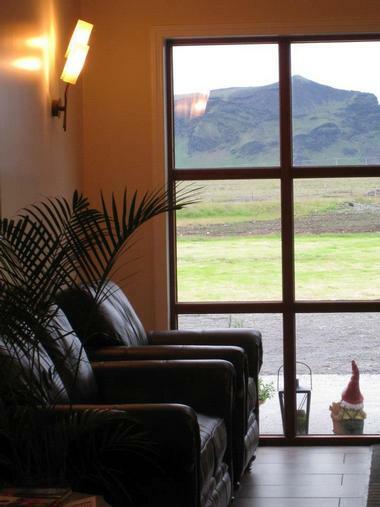 Situated only an hour and a half away from the airport, Hjardarbol Guesthouse is in the perfect location for people who want to enjoy the beauty of the countryside without being too far away from the amenities of Reykjavík. The rooms have either shared or private bathrooms, and all guests are welcome to relax in the communal lounge and use the complimentary Wi-Fi. 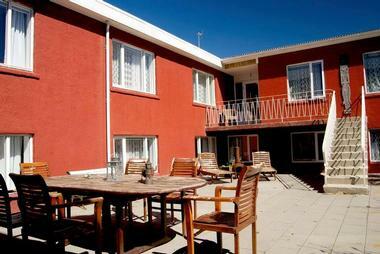 There is also a charming outdoor terrace that offers spectacular views of the nearby Ingolfsfjall Mountain. Breakfast is included in the room rate, and there is an on-site souvenir shop that sells locally made handicrafts. Nestled in one of Iceland's most beautiful farming areas, Hótel Fljótshlíð is an eco-hotel located on a working horse farm that also offers horseback tours of the surrounding area. The hotel has 14 large rooms with private bathrooms, free Wi-Fi, and satellite television; there are no cooking facilities, but breakfast is included in the price of the room and there is an on-site restaurant that serves dishes prepared with ingredients from the farm. Several other types of accommodation are available as well, including cozy cottages and chalets, a campground, and a guesthouse with a communal kitchen. A luxurious four-star hotel not far from the Sog River, Hotel Grimsborgir offers upscale rooms and suites with private terraces, flat-screen TVs, and coffee and tea making facilities. There are also two, four, and five-bedroom apartments; most have full kitchens, and many have private hot tubs. Shared hot tubs are available to guests who don't have their own, and all guests are welcome to relax in the cozy hotel lounge or to enjoy a meal at the elegant hotel restaurant. A complimentary breakfast buffet is served every morning, and free Wi-Fi is available all throughout the property. Proudly family owned and operated, the House On The Hill – Guesthouse consists of double rooms and a private apartment with a kitchen on the ground floor of the owners' home. All accommodation options offer stunning views of the surrounding mountains and glaciers, and they share access to a comfortable lounge room and a bathroom with a shower. The rooms come with flat-screen TVs, and the Wi-Fi works all throughout the home. Free parking is available, and the house is located within easy walking distance of the harbor, the local swimming pool, the museum, and the town center. 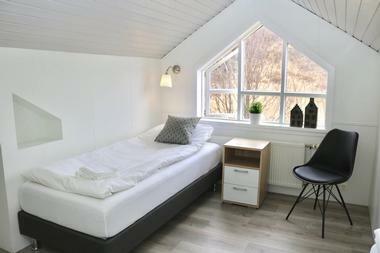 Hrifunes Guesthouse is run by a friendly couple who also own a travel company that hosts unique photography tours, and guests who choose to stay here will experience a taste of true Icelandic hospitality. 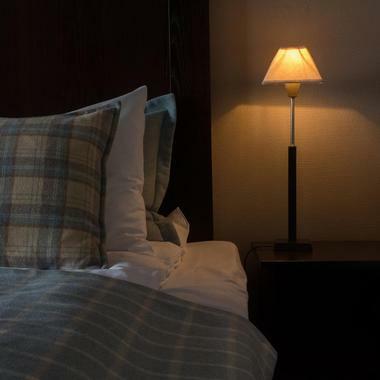 Both double and triple rooms are available; there is a choice between private or shared bathrooms, and complimentary toiletries are provided to all guests. A complimentary breakfast is served every morning, and guests can also choose to enjoy the delicious homemade three-course dinners that are served every night at the communal kitchen table. All of the food is prepared from scratch using high-quality ingredients, many of which are sourced locally. 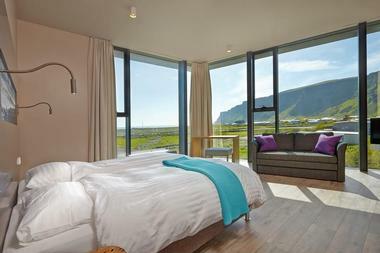 Sitting at the base of some rolling sandstone hills, Icelandair Hotel Vik is a modern hotel with more than 80 rooms, all of which offer stunning views of either the sea or the cliffs. 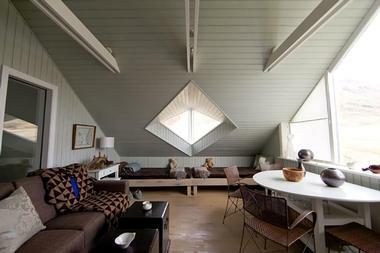 The rooms are decorated in a contemporary style inspired by traditional Icelandic design, and some have pull-out sofas or lofts. 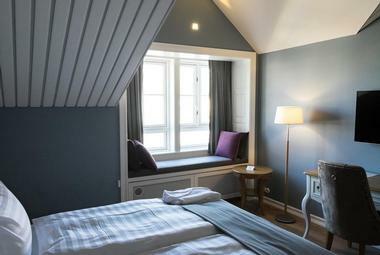 There are also several small cottages right next to the hotel; these offer twin rooms with private bathrooms. The hotel restaurant specializes in regional cuisine, and every morning guests can enjoy a complimentary breakfast buffet while admiring beautiful views of the water. 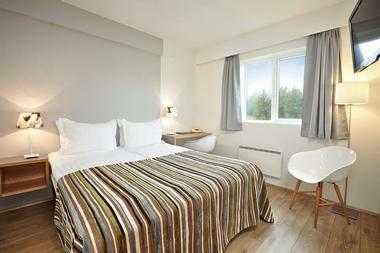 With its 57 Scandinavian-style rooms, Icelandair Hotel Klaustur makes an excellent base for exploring the natural beauty of southeast Iceland. Skaftafell National Park is only 1 hour away, and there are also plenty of attractions in the immediate vicinity, including a geothermal swimming pool right next to the hotel, an excellent golf course only 3 miles away, and a beautiful waterfall that can be walked to in 5 minutes. All of the rooms are equipped with complimentary Wi-Fi and flat-screen televisions, and hotel amenities include a large restaurant and an inviting bar with a terrace. 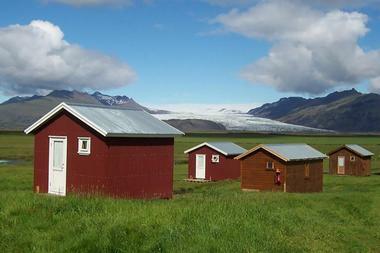 As you might guess from the name, the Lambhus Glacier View Cabins by Vatnajökull National Park offer spectacular views of the Vatnajökull glacier, the biggest glacier in Europe. The charming one-room cabins can accommodate between four and five guests, and they include convenient kitchenettes and private bathrooms. Several restaurants can be found within easy driving distance for guests who don't want to prepare their own meals, and the amenities of the village of Höfn are less than 20 miles away. The staff are always happy to give tips on activities in the surrounding area; popular options include hiking, snowmobiling, and kayaking on the glacier lagoon. The Lava Water Accommodation Miðhraun is located on an organic sheep farm, and it holds the unique distinction of sitting right on the edge of a stunning basalt lava landscape. Not only does this lava field make for some truly wonderful scenery, but it also provides the farm with water and geothermal energy. The accommodation on the farm is perfect for both long and short stays; it consists of fully equipped and self-catering apartments, and a cleaning service is provided upon request. The apartments range from one bedroom to four bedrooms, and the nearest town is approximately a 30-minute drive away. Less than half a mile off of the Ring Road, Nónhamar offers a selection of self-catering cabins that can accommodate up to four people each. The one-room cabins are simple but cozy, furnished with wood-paneled walls, kitchenettes, bunk beds, and private bathrooms with showers. Free Wi-Fi is available in all the cabins, and guests are provided with linens, towels, and basic kitchen utensils. 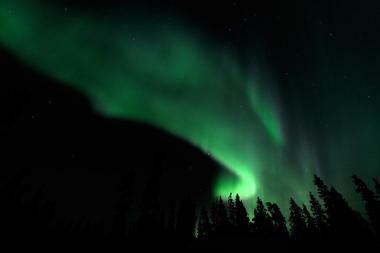 Beautiful scenery can be seen all around the cabins, and if you're not content to simply admire the view, the staff are happy to recommend the best tour operators and activities in the area. 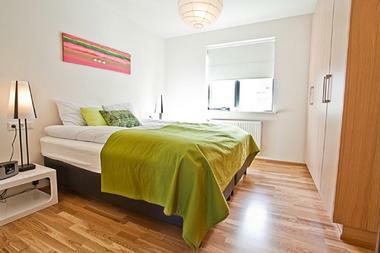 Providing upscale apartment-style accommodation in the heart of Iceland's capital, Reykjavik4you Apartments Hotel is the ideal choice for visitors who prefer to be able to self-cater during their stay. The apartments all boast kitchens and sitting areas; some also have balconies or separate living rooms and dining areas. Furnishings include flat-screen TVs, iPod docks, and comfortable linens, and Wi-Fi is available to guests at no additional cost. The reception desk is open 24/7, and the tour desk is staffed by friendly agents who are happy to help arrange day trips and activities in the surrounding area. Catering to backpackers and travelers on a budget, Selfoss HI Hostel offers dormitories and private rooms that can accommodate between one and five people. Breakfast is included in the room rate, and packed lunches are available upon request. A communal kitchen, games room, and hot tub are available for guests to use, and the town of Selfoss provides all the amenities you might need, including restaurants and cafes, grocery stores, and a thermal swimming pool with a sauna. Plenty of other recreational activities are available in the area well; highlights include hiking, mountain biking, paintballing, and golfing. 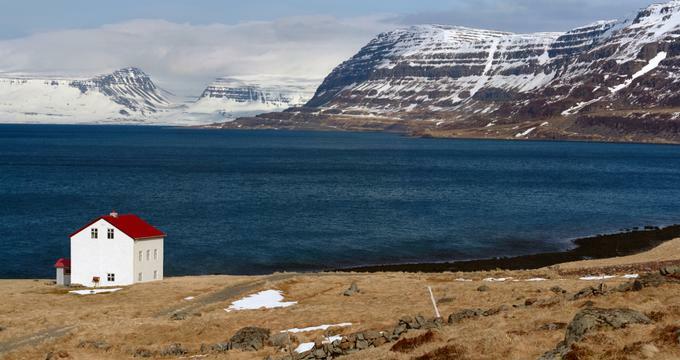 Boasting an excellent location on a fisherman's marina in the Siglufjörður fjord, the Sigló Hótel has more than 60 rooms, all of which have stunning views of either the water or the mountains. Guests can appreciate the scenery from their window seats or private balconies, but the rooms also offer flat-screen TVs and complimentary Wi-Fi for visitors who want to catch up with friends and family or watch their favorite shows. The restaurant inside the hotel offers a great selection of drinks and light meals; the hotel owns two other restaurants as well, both of which are within walking distance. 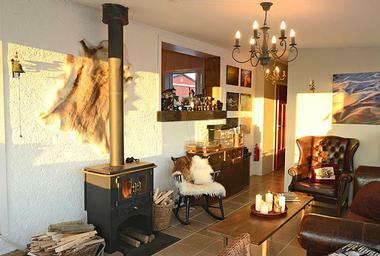 Owned and operated by a friendly couple from Reykjavík, the Silfurberg Farm & Hotel is in the perfect location for visitors who want to explore East Iceland. The property is tucked away in the bottom of the Breiðdalur valley; the lack of light pollution makes it a great spot for stargazing, which can be done from the inviting outdoor hot tubs. Guests can choose between four double rooms and a family-friendly suite, all of which offer free Wi-Fi and private bathrooms. Breakfast is included in the room rate, and other meals can be arranged upon request. Designed to compliment the surrounding lava landscape, Silica Hotel is conveniently located within walking distance of the beautiful Blue Lagoon geothermal spa. All hotel guests are given a complimentary day pass to the Blue Lagoon, but the hotel also offers its own peaceful swimming lagoon, which is reserved specifically for the use of guests. There are 35 rooms for guests to choose from; all rooms boast flat-screen TVs and private verandas with excellent views. A complimentary breakfast is provided each morning, and guests are welcome to make use of the hotel gym and spa facilities. Found in a remote part of the country only 25 miles away from the Sigöldufoss waterfall, the Highland Center Hrauneyjar offers accommodation for almost every different type of traveler. Families and groups can rent out one of the two-bedroom apartments, which come with kitchens and enough space for up to six people, while couples will enjoy the comfortable double rooms. 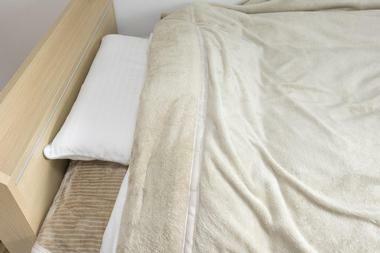 There are even basic "camping-style" rooms available for travelers on a budget; no linens are provided, and guests are given access to a shared bathroom. A simple restaurant is available on-site, and there is no extra fee for parking. 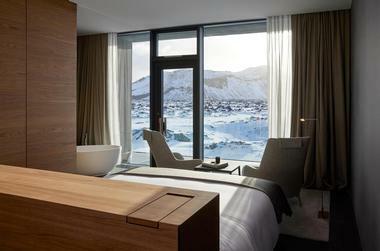 Opened in 2018, the Retreat at Blue Lagoon Iceland is a luxurious five-star retreat located right at the Blue Lagoon, one of the most popular attractions in the country. The elegant suites boast floor-to-ceiling windows and terraces or balconies that offer incredible views of the surrounding lagoon and volcanic landscape, and all room rates include full access to the spa and the lagoon. Guests are also invited to enjoy the hotel restaurant, which specializes in gourmet reinventions of traditional Icelandic dishes and offers a unique, upscale experience that you won't be able to find anywhere else. Only 1.25 miles away from a stunning black sand beach, Brunnavellir Accommodation is an inviting farmhouse surrounded by the beautiful scenery of the Vatnajökull region. 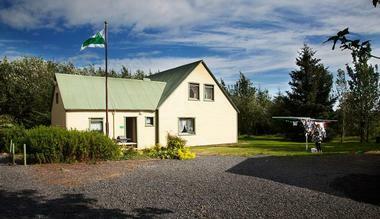 The property is conveniently located less than a mile off of Iceland's main road; the nearest town is approximately 35 miles away, and there are plenty of excellent hiking trails in the area. Guests can choose between single, double, and triple rooms, and small groups can rent out the entire home if desired. Both of the hosts can speak English, and guests are welcome to prepare their meals in the home's communal kitchen. Sitting in the heart of Reykjavík, Fosshótel Reykjavík is one of the newest and biggest hotels in the country. There are more then 300 rooms and suites spread out over 16 floors; all are equipped with flat-screen TVs, coffee and tea making facilities, and mini-fridges, and many offer excellent views of the ocean or the city skyline. A complimentary breakfast buffet is available every morning, and guests are more than welcome to enjoy a meal or a drink in the hotel restaurant or in the trendy beer garden. A fee is charged for parking.